Sometimes you find a record that has so much information it is worth it’s weight in gold. Before I found this death certificate, all I knew about Cordeale (possibly spelled Cordelia) was her name, approximate birth year, parents’ names, and location on the 1880 census. My great-grandfather’s residence in 1928 (he was the informant – Cordeale is his sister). It also confirms her parents as Francis Kendrick and Barbara Baxter. Look for Cordeale’s marriage record (also in Georgia’s Virtual Vault). Look for other relatives who may have died in Georgia between 1928 and 1930. Look for Cordeale on 1920 census. 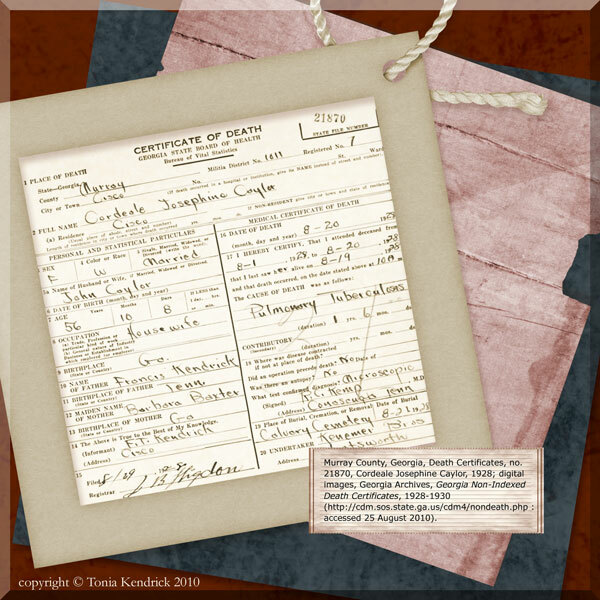 Check back tomorrow to learn how I located this and other Georgia death certificates from 1928 to 1930.